Top finishers from Florida at the AAU JO Championships in Texas. Metro-Dade Track Club took the national title in the girls 14-year-old 4x400 with a 3:48.20. The team included Daesha Rogers, A'Sja Baker, Jazmin Smith, and Taranique Alexander. Deanna Hill was third in the 15-16 200 and fourth in the 100 with times of 24.19 and 12.03, respectively. Adrianna Allen took fourth in the 17-18 400 meter dash with a great time of 53.99. That is a big new personal best for her, at least according to our records, she had never been under 55 seconds previously. Tamari Davis of Gainesville swept both the 100 and 200-meter races in the 9-year-old division. In the 100 her time of 13.78 was into a strongly negative wind. And her 27.78 (neutral wind) in the 200 meters dash was a new national meet record! Amir Rasul swept the 14-year-old boys 100 and 200 meter dashes. The Miami native went 11.02 (0.1 wind) and 21.95 (-0.9 wind), respectively. Jalasia Tillman took silver in the 12-year-old 100 meter dash with a 12.70. Ulani Toussaint was the silver medalist in the 12-year-old 200 meter dash with a 25.89 into a negative wind. Miami Gardens Xpress Track Club won the 12-year-old girls 4x400 in 4:02.14. Chanel Dawson took third in the 12-year-old 6# shot put with a 35-4.5. Symone Mason was second in the 13-year-old 200 with a 24.62 into a -1.7 wind. 8-year-old Jordan Gouldbourne took the gold in the 100 meters (13.94) and silver in the 200 (28.87). Miami Gardens Xpress Track Club won the 8-year-old boys 4x400 in 58.25. The club also took titles in the Boys 14YO 4x400 (3:27.54) [the B team also took bronze in 3:32.44], Girls 12YO 4x400 (4:02.14), 12YO Boys 4x100 (48.67), and 12YO Boys 4x400 (3:48.12). Jaden McBurrows took third in the 9-year-old 200 meter dash with a 26.80. Austin Cowans was bronze at 100 (13.34) and silver at 200 (26.74) for the 10-year-old bracket. Trevor Wilson took third in the 11-year-old 100 (12.75) and second in the 200 (26.02). Willie McKnight II swept the 100 and 200 in the 12-year-old division with times of 11.94 and 24.09. Terrance Horne took third in that 100 with a 12.11. Jamal Walton was the champion in the 14-year-old boys 400 with a 50.17. Kenrick Young was fourth in the 15-16 Boys 400 Meters with a 48.66. Juan Paul Green DNSed in the 17-18 400, after some really great somethings in the prelims. 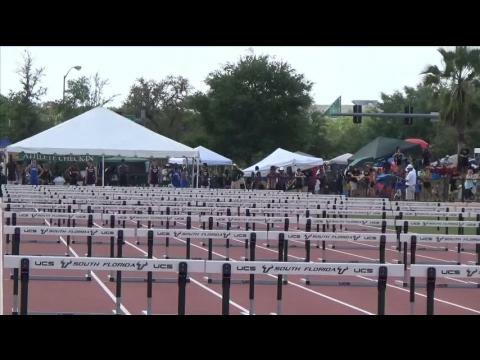 The great Aldrich Baily of Texas was first in those finals with a national meet record 45.45. Shanell Atkins tossed the 6# shot 46-5 (14.14m) for second place in the 14-year-old division. Kaitlyn Jenson broke the former national meet age group record in finishing second place 130-1 (39.64m) in the 14-year-old Javelin Throw. She also finished sixth in the shot with 41-11. Two Floridians were on the medal stand of the 11-year-old long jump. Jeremiah Davis won with a 16-6.5 (5.04m) and Deeshari Keith took third in 16-3.75 (4.97m). Juan Paul Green ran a stellar 47.36 in the 17-18 400 meter prelims to finish in the third seed spot, just .1 behind Olympic Trials competitor and national leader Aldrich Bailey's seed time. Thursday - Daesha Does it Again! Daesha Rogers.... what can you say? She blastest yet another national meet record, this time in the 1500 Meters with a 4:36.79 in the 13-year-old division. That converts to a 4:57.13 for 1600 meters, which is actually rather conservative for her. The nearest competitor in the age group was eight second back. The time was the fastest on the day in ANY girls age group. 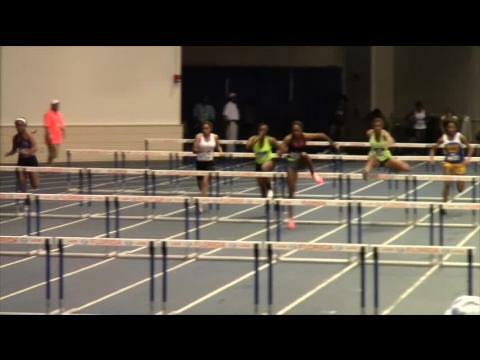 Jamika Glades took second place into a strongly negative wind (-2.2) with a 14.32 in the 17-18 100 meter hurdles. A wind-aided long jump of 17-11 earned Gainesville's Keondria Waters the national title in the 13-year-old division. Sophia Gustely took second in the 13-year-old discus with a 102-7 for the 600 gram implement. Eddiyah Frye took third in the 9-year-old long jump with a 13-3.25 (4.04 meters). In the 15-16 division, Shadayzha Bullock of Gainesville took third place with a 41-1. Xavier Atkins will be the top seed into the 15-16 200 meter finals as well (he is top-seeded already for the 100). He won heat two with a 21.38 into a -2.2 wind. Clearwater's Carson Waters finished second in the 15-16 pole vault with a 14-6 jump. Fredrick Jones was second in the 15-16 shot put with a 54-4. American Heritage state champ Walter Tucker took third in the 17-18 110 Meter Hurdles with a time of 14.44 into a -1.5 wind. Daesha Rogers wins, breaking her own national meet record from two days before, with a huge 2:07.65. That is a big new personal best for the seventh grader and it dominated the 13-Year-Old division, with second place eight seconds back. 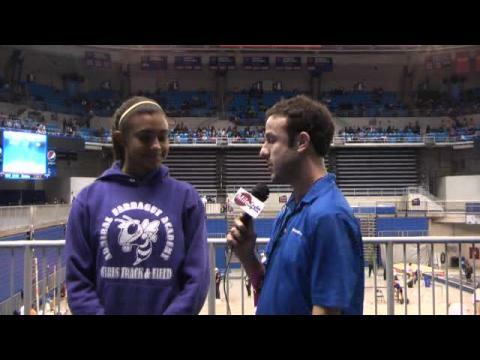 Daesha's teammate A'Sja Baker (also of American Heritage) took seocnd place in the 14-year-old division with a 2:17.28. Darrielle McQueen took silver in the 15-16 long jump with a 19-2. Lloydricia Cameron set a new personal best of 150 feet even in the discus, winning the 15-16 age group national title in the process. Phoebe Gustely was seventh with a 122-3. Ke'Naria Gadson took silver for the 10-Year-Old Division of the 800 with a 2:20.61, missing gold by .31. Long jumper Jasmyn Dorsey of Daytona Beach took second with a 14-1.5 for the 10-Year-Old group. Amir Rasul put up a stellar time and will be the top 14-year-old seed into the finals. He ran a 11.09 into a negative wind, with the closest competitor in his heat .37 back. In the 14-Year-Old 800 meter finals, Emare Hogan of Orlando took second with a 1:58.55. 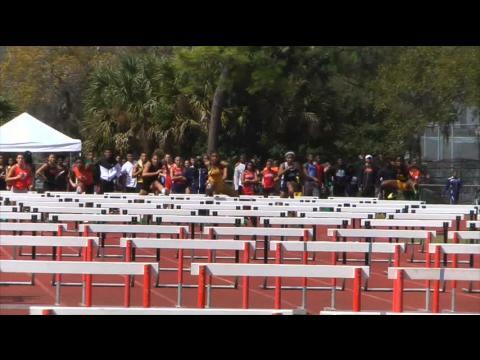 Xavier Atkins of Spruce Creek continued his impressive run through the prelims... he was the top seed out of the first round and will be the top seed into the finals after a 10.60 today. Austin Droogsma took the silver medal in the 17-18 shot put finals, tossing the shot 54-4.5. In the 13 Year Old discus throw Sophia Gustley through the 1K disc 116-6 for second. Courtney Gibson long jumped 18-1.25 in the 14 Year Old division, third place. 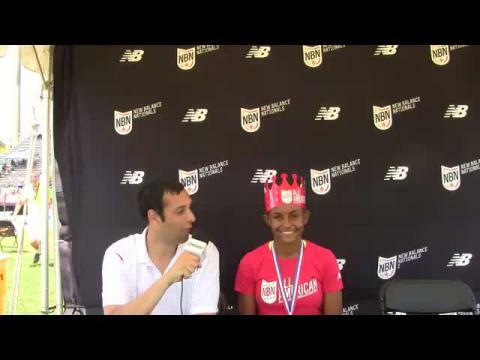 In the 15-16 triple jump, Darrielle McQueen won the national championship with a 40-3 mark. Shykeem Jacques high jumped 5-6 to finish third in the 13 year old division. Charles Nelson long jumped a huge 24-9.5 in a competitive field to earn fourth place in the 17-18 division, with legal wind. Austin Droogsma won the national title in the discus with a 180-2 for the 17-18 division. 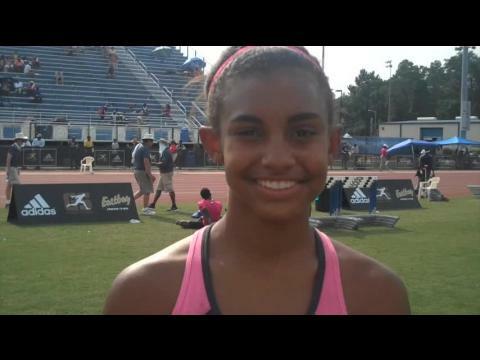 Daesha Rogers of American Heritage ran a meet record 2:09.69 in the prelims of the 13-Year-Old 800. The next competitor was ten second back. Rahyah Anderssohn finished second in the 11-Year-Old 3000 in 11:33.31. Orlando's Mikayla Shields won the 14 YO Triple Jump with a 37-2.75 with legal wind. Stacey Destin on the 15-16 High Jump with a 5-8 effort. In the 12 Year Old High Jump, Kamron Lee took second in 5-2. Xavier Atkins is the top seed out of the 15-16 100 Prelims witha 10.74 into negative wind. Missing gold by just seven points, Gabriel Moore of Freeport took the silver with 6393 points in the 15-16 Decathlon. Brittany McGee finished fourth overall in the 15-16 Heptathlon with 4326 points.